Steven Birchfield, an astrologer and philosopher, has been writing a series for us on Hellenistic Astrology, the underlying basis of our system. This section continues his fascinating exploration of the Living Signs, especially with regard to the aspects and the concept of signs "casting a glance" at one another. Aspects were the sense of sight to the zoidia. In fact the word "aspect" comes from the Greek word "to look". The different types of glances the zoidia have towards each other are the same in all respects that a person would make. Psychologically we make a distinction between things that we see (which is a passive action) and things that we perceive or behold (when something "catches your eye" and we consciously receive an impression). 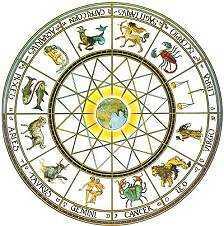 Similarly, the zoidia made distinctions in how they looked or saw ahead in the order of the Zodiac while they perceived those following them. In Medieval astrology seeing ahead became known as 'sinister' and perceiving behind as 'dexter'. Of course there is an order and geometry to the Greek concept. Ibn-Ezra in his Book of Reasons, gives us a unique perspective as to the harmonics involved in the Hellenistic model—but it was not necessarily just the geometry that decided it or made the rules by which it applied. It was not just an applied science that determined how the aspects were formed, but also a quality of life through 'familiar' relationships, which the mathematical concept supports and gives testimony to. What a zoidion sees or perceives, just like with us, is dependent upon its position in respect to the other zoidia. When we look straight ahead at an object, what happens? You see that object, but the things which are immediately on either side fall out of perspective. Extreme cases of this are called "tunnel vision". As I am writing this I am looking straight ahead at my screen and that is where my attention is focused. I have a coffee cup standing on my desk next to my screen, but although it's in my field of vision it falls out of perspective. In order to 'perceive' that cup I have to shift my eyes and attention. If Aries looks at Libra then the immediate zoidia on either side of Libra fall out of our perspective. The object of focus is Libra, the opposition, while the zoidia Scorpio and Virgo, are no longer in the field of perception. These two zoidia then were in "aversion" to Aries, or what we know as inconjunct. Likewise again looking straight ahead from Aries, our vision does not cover a full 180 degrees or what we call peripheral vision, and neither could the zoidia. They could not see or perceive those zoidia that were immediately beside them. So Aries could not see or perceive Taurus or Pisces, or what we call the semi-sextile. Abu Ma'shar gives us a little different perspective by also telling us that while Gemini and Leo are equal in power, Gemini obeys Leo. Abu Ma'shar gives us those zoidia that are of short ascension (direct) as obeying those of long (oblique) ascension. Paulus is very precise also in distinguishing those zoidia that are just 'seeing' and those that 'perceive'. 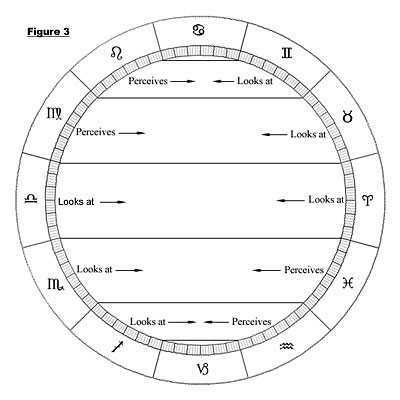 You probably notice that Paulus' relationships of 'seeing' and 'perceiving' are reversed in the lower half of the zodiac. It is most likely that this 'seeing/perceiving' relationship represents the true realities of the hemispheres. In our northern hemisphere Pisces is of short or direct ascension, however if you are in the southern hemisphere Pisces is of long or oblique ascension. Thus Pisces 'perceives' or commands and Scorpio (short ascension in the southern hemisphere) 'sees' or obeys. I think too, that perhaps the terms 'command' and 'obey' are a little misleading. In the military you have a clear 'command and obey' relationship. However here we have more of a business relationship or partnership. In a large company you may have several department heads or in a law firm you may have senior partners. These heads are on equal authority but there is a co-operation that exists because they are working towards a common goal for the company. In the company I work for in the ship industry, we have heads of engineering, heads of design, heads of specifications and heads of production etc. It is not unusual that the head of engineering needs the principle drawings from the design department head. In order to produce a ship on time, the formers' need becomes a 'command' that the latter 'yields' to in order for a harmonious functioning in the company. Both have 'equal' authority but there is this sense of need and yielding. And this is the relationship that the zoidia that see and perceive have to each other. In successful close personal relationships there exists this same familiarity. Now if most of you are like me, while enjoying and appreciating perhaps, the more 'romanticist' symbolism in this, I like to see the practical application. It is the practical application that brings us to the heart of the whole purpose in the concept of the 'living signs' and that is perfecting the function of the planets that may be positioned there. Basically what we have in this statement is the idea that the familiar relationship the zoidia have to each other could significantly strengthen the effect of the aspects between the planets posited there. The sextile between Gemini and Leo was greatly increased in strength as compared to the sextile between Leo and Libra. In fact the relation between Leo and Libra half reduced the sextiles efficiency. This is quite similar in fact, to the result of a harmonious work environment on the job being conducive to higher productivity. As an example, if you had the Moon posited at 12° Leo and the Sun was at 15° Gemini, the Moon is applying a sextile aspect to the Sun. In this case, however, the Moon would appear to have some difficulty in functioning, as in the domicile of the Sun she is lacking any essential dignity. You would have the same results if you invited a total stranger off the street to run your household and family and take care of your financial affairs while you took the week away from home. In order for her to regain some dignity here she would need to be received by the lord of this domicile. She is, by the sextile aspect from the Sun to some degree, although the sextile is the weakest of the favourable aspects and the Sun is also without appreciable dignity in Gemini. Applying the aforesaid 'familiarity' between the zoidia, there is already a stronger mutual friendship and the sextile is made into the strength of a Trine. There is less demand on the planets themselves to be dignified. Since the Sun is in Gemini, the yielding partner, then the Moon is receiving considerably more support in her position, thus the zoidia themselves contribute to the planets effectiveness. 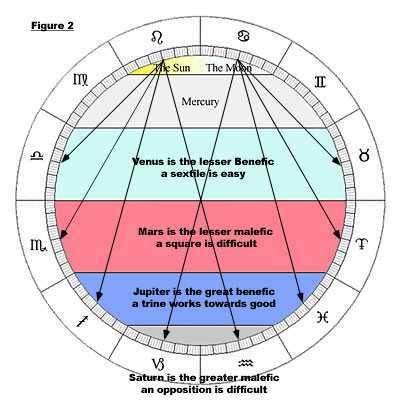 "But in the prorogation made into succeeding signs, the places of the malefics, Saturn and Mars, are anærectic, whether meeting the prorogator bodily, or by emission of rays in quartile, from either side, or in opposition;"
The trine and sextile aspect could cause problems but were not usually deadly except in one situation, namely when the malefic was in a sign that "sees and obeys" the sign where his ray fell. "They are sometimes anærectic by sextile ray, if in a sign of equal power, obeying or beholding the sign of the prorogator." In this particular case then the effectiveness of these zoidia works contrary to the good of an individual. The effectiveness is then indiscriminate to the planets and what they signify will be increased in efficacy whether for good or ill. So one attribute or characteristic of the 'living' zoidia is that they have sight. Let's move on and see if we can discover others. These zoidia have an unequal but cooperative relationship with each other. Valens calls them 'hearing and seeing zoidia' and they are equally distant from the equinoctial zoidia. This relationship is also based on the diurnal arc of the zoidia. Once again if we look at the table of diurnal arcs we see for example that Taurus has a diurnal arc of 200° and Pisces has one of 160°. 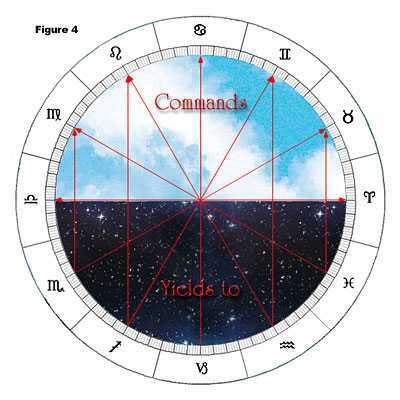 Together they equal 360°, the complete circumference of the zodiac. This is a little different relationship than we saw previously where both zoidia had equal authority. We also have the sense of sight here, as these zoidia also have a relation by aspect, only here we have a stronger sense of authority and compliance. In our previous example was also compliance but it was based on a common purpose and good will. In this case it isn't just a question of good will but of service. If we digress to my previous analogy in the business place, here we have the department head and his subordinate. A department head isn't a head unless he has a body under him, and that is those who perform the task required so he can be free to do the things that only he can do. It's called delegating responsibility. In order for the department head to effectively do his job he needs a complimentary staff: together they get the job done. As any good leader knows, in this kind of relationship familiarity can easily breed contempt, so there is a certain respectful distance between the two. I liked very much the way Curtis Manwaring describes this relationship. As with the zoidia that 'see and perceive', these that 'see and hear' also produce effective results. The sextile between Taurus and Pisces and Virgo and Scorpio are especially benefited from this relationship as Paulus told us, "if found in zoidia which hear or see one another." So here as above, the same rule applies and these sextiles take on the characteristics of a trine. 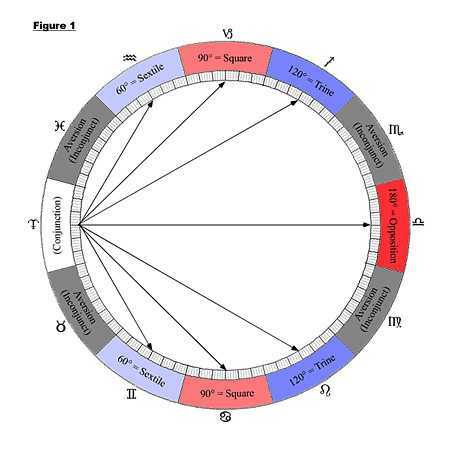 If you'll study closely the table of diurnal arcs, you'll notice that Pisces is not the only 'complementary' zoidion to Taurus, so is Scorpio. This presents us with some very interesting insights into the nature of oppositions, which I will discuss later. Following is a table that I've made to represent these relationships. This is the end of part two of The Living Signs. Click here to read part three of The Living Signs. Chapter 11 of of Paulus' Introductory Matters, "Late Classical Astrology: Paulus Alexandrinus and Olympiodorus with the Scholia from Later Commentators" — Translation by Dorian Greenbaum — ARHAT Publications. Signs that are 'direct' rise at an angle to the horizon that is nearer to a vertical 90°. The 30 degrees of longitude of these signs require 30+ degrees of equator to rise across the horizon and take more than 2hrs to rise and so they are termed 'signs of long ascension'. Signs that are 'oblique', some authors called these 'crooked', rise at an angle that is more slanted. This slant ensures that the whole sign rises before 30° of the equator has passed the horizon and is why they were called 'signs of short ascension'. Chapter 8 of Paulus'Introductory Matters, "Late Classical Astrology: Paulus Alexandrinus and Olympiodorus with the Scholia from Later Commentators" — Translation by Dorian Greenbaum — ARHAT Publications. Chapter 10 of Paulus' Introductory Matters, "Late Classical Astrology: Paulus Alexandrinus and Olympiodorus with the Scholia from Later Commentators"— Translation by Dorian Greenbaum - ARHAT Publications. Bk I ch.7 — "The Anthology" of Vettius Valens, Translated by Robert Schmidt and published by Golden Hind Press.